I love your Zebra bag, super cute. 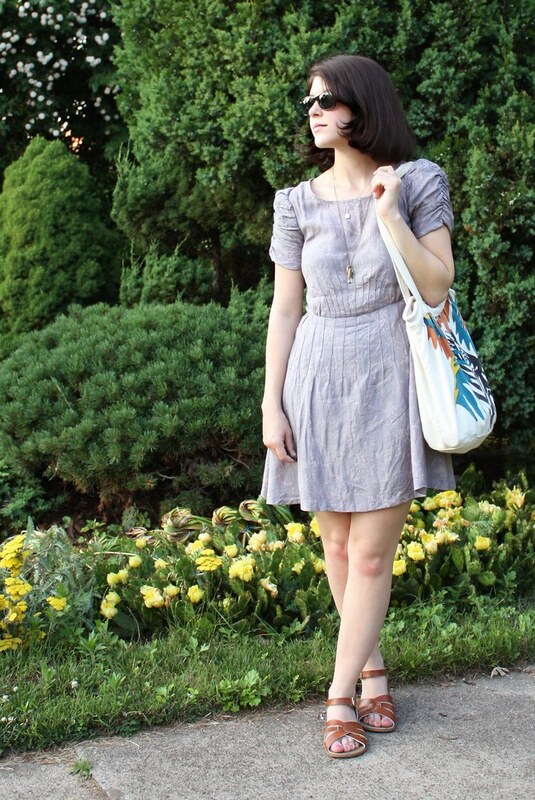 Great dress - perfect for a beautiful summer day! The dress is summery, and so pretty on you Miss. I just can't get over your awesome skin... creepy? I always find your outfits intriguing but it's more than that. It's not just your clothes but your entire presentation that transfixes me. You display an unexpected mixture of seemingly inconsistent qualities. You are both young and mature, both girly-cute and sophisticated-beautiful, both light-hearted and serious-minded. I don't know you but you mesmerize me. Few people do that. That dress is adorable and looks so nice and light. Such a perfect outfit for summer! Great zebra bag too! Aw, what a lovely comment from Shybiker! I think you look effortlessly lovely. And this post reminds me to get off the internet already and get out and enjoy the sunshine! You look gorgeous. Like sporting a super effortless outfit for the beach, but at the same time immensely chic! Unfortunately, I don't know anything about keeping the wrinkles away but you still pull the dress off! Your photos are always amazing! I love the ruched sleeves and pin tucks on this dress. This might sound weird, but I think the color looks really good with your dark hair (and sunglasses) too. Kallie you look like an absolute doll! 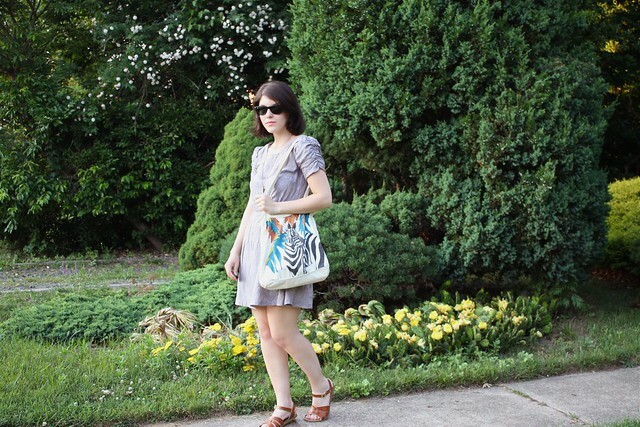 I love the dress and your tote bag! Super cute sandals - I knew those were saltwater sandals the moment I saw them! 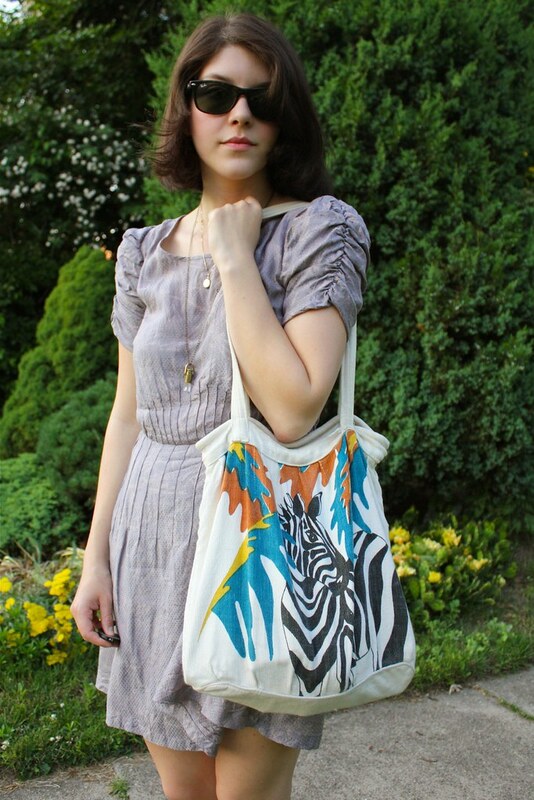 Cute zebra tote! But unfortunately, I don't have a solution for the wrinkling...happens to me all the time! I've been thinking about getting a pair of those Saltwater sandals since I heard they're super comfy, but I was afraid they'd look like little kid shoes. They totally don't! I'm sold. What lovely photos of you!!! Gorgeous.